China's Moon Rover Separates From Lander : The Two-Way The kind of technology aboard the rover has never been on the moon. Scientists hope the rover can uncover ancient scientific records trapped between lava flows. China's first lunar rover separates from Chang'e-3 moon lander early Dec. 15, 2013. This picture was taken from the screen of the Beijing Aerospace Control Center in Beijing, capital of China. 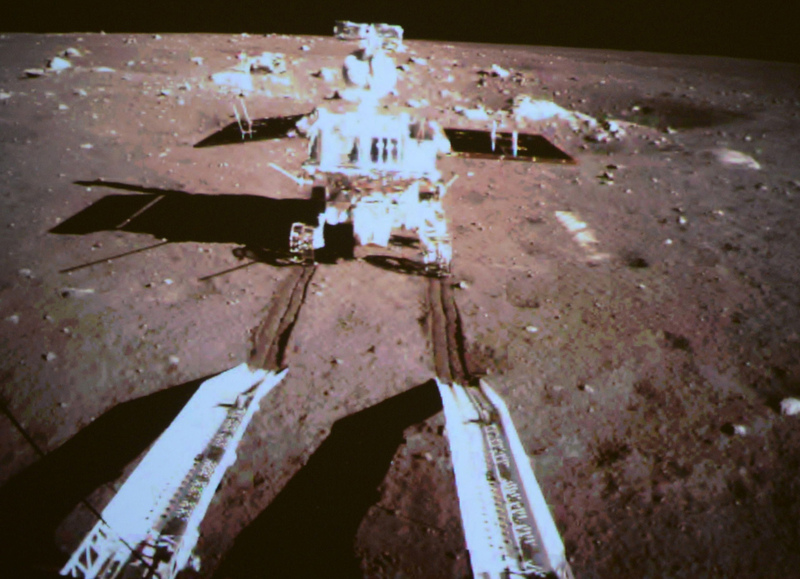 Very early Sunday morning, China's moon rover, "Yutu" or Jade Rabbit, separated from its lander and began its exploration. This means that China has officially joined the United States and the former Soviet Union as as the only countries to make a soft landing and drop an exploratory vehicle on the moon safely. "The 140 kg six-wheeled rover touched the lunar surface at 4:35 a.m., leaving deep trace on the loose lunar soil. The process was recorded by the camera on the lander and the images were sent to the Earth, according to the Beijing Aerospace Control Center. "After the separation, the rover and lander will take photos of each other and start their own scientific explorations. "Engineers made final checks of the environment of the landing site, the situation of the probe and the solar incidence angle late night on Saturday and sent signals of separation to Chang'e-3. "Yutu, atop the probe, extended its solar panel and started to drive slowly to the transfer mechanism at 3:10. The transfer mechanism unlocked at 4:06 with one side reaching the moon's surface, allowing the rover to descend to the surface following a ladder mechanism." As we reported, yesterday, this is a big deal for China, as it shows off its technical prowess and is a point of national pride. But it's also a big deal for mankind. The rover is equipped with the kind of technology that has never been on the surface of the moon. So, it may tells us about the ancient scientific records trapped between lava flows. Xinhua reports that the rover will explore the moon for three months, while the lander will continue to explore the landing site for one year.